Throughout the year, our Medical Director, Dr. Jeff Vogel, and our Health Care Consultant, Dr. Christine Duncan, work to ensure that we provide our campers the best care possible. This includes updating our Camper Medical Policy, recruiting a strong team of licensed health care professionals to join our Med Shed, and thoroughly reviewing and approving each camper's health forms before we even get to camp. If needed, our team will reach out to a camper's family or treatment team when appropriate to clarify any questions and ensure they are well-versed in each child's needs while they are in our care. While at Overnight Camp, we transform one cabin into our "Med Shed", where licensed doctors, nurses, and physician assistants can be found anytime throughout the day or night. Our medical team checks in on campers regularly throughout the week to make sure everyone is staying hydrated, sunscreened, and well-rested. Our Med Shed team also administers daily medications and provides any first aid care as needed. We have an incredible team of experienced medical professionals returning to our Med Shed in 2019. Please check back shortly for their photos and short biographies! Camp Casco abides by all state health regulations for summer camps and will be licensed by the Yarmouth Port Board of Health (previously licensed by Becket Board of Health). 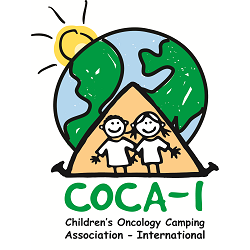 Camp Casco follows the Gold Ribbon standards suggested by Children's Oncology Camping Association, International. “Camp Casco is my daughter's happy place. There, one can expect their child to experience a place of intense positivity and personal growth. After camp this summer, [my daughter] has grown tremendously since her cancer diagnosis by challenging her body and soul with the support of the amazing councilors. [She] also gained a sense of peace and acceptance within herself. She achieved this emotionally by participating in Circle Time, sharing her thoughts and feelings (normally something very difficult for her), and physically by challenging herself to try new things while honoring her body when it was time to take a break. Not only do the councilors at Camp Casco communicate these breakthroughs with us throughout the week, but they also celebrate them with the children."